Press Relase sent by Hobie Class //// : "For race results, photos and videos, head to hobie16europeans.com to check out all the action!" 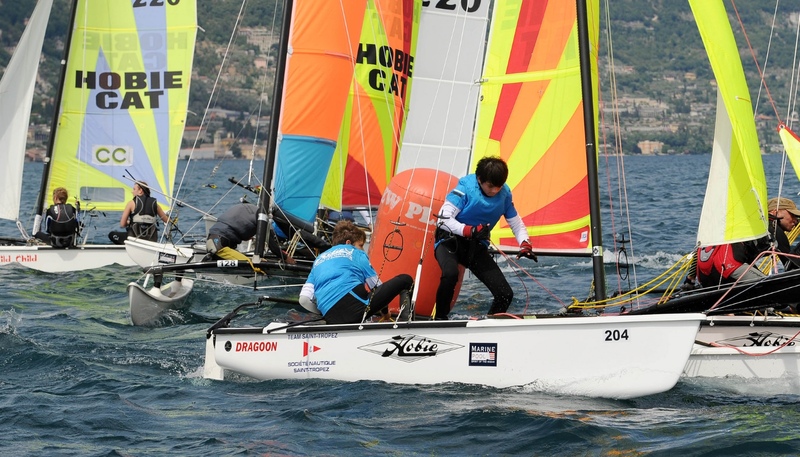 Hobie Dragoon Worlds and Hobie 16 Europeans’ first disciplines begin today in Gargnano. Day three for the Hobie 14 Worlds saw the increase competitors for the different classes. The 5th Hobie Dragoon Worlds and the European championships started for the Hobie 16 Youth with Spinnaker, Hobie 16 Women, Hobie 16 Masters, Grand Masters and Great Grand Masters and Hobie 16 Open with Spinnaker started racing. The Hobie 14 and Dragoon World Championships are on one race course to the south with the respective Hobie 16 classes on a separate race course. Very light rain caused a slight delay as the wind settled the built to a 15+ knots for some exciting racing in Gargnano - Lago di Garda – Italy. Blaine Dodds extended his lead with a first and second. Blaine said “I had a good day and the first race the wind was stronger and all felt good. In the second race in the lighter condition I was lying on the trampoline and Georgia was out on trapeze. The conditions even out the racing”. The Hobie Dragoons are having a wonderful battle after 2 races with only 2 points separating the top four places. In the Hobie 16 Women reigning World Champion Bella Zanesco has a small lead over fellow Australian Michelle Bursa. In the Hobie 16 Masters former multi Hobie 16 World Champion Shaun Ferry RSA is trailing Ingo Delius from Germany. In the afternoon the race committee ran two races for all the classes except for the Hobie 14 which had three races. The wind was 14-16 knots. Great Grand Master Kerli Corlett when coming back up the boat ramp “awesome, that is awesome racing”. Former Hobie 16 World Champion Shaun Ferry after a break from Hobie 16 racing, ‘that was so much fun and I remembered how much fun a Hobie 16 is, we found our groove in the afternoon’. Racing continues tomorrow. With the last day of sailing for the 15th Hobie 14 Worlds.